Are we alone in the universe? What would happen after we discover microbial life on another planet? What if extra-terrestrials are already here? Questions don’t get much bigger than the ones that are discussed in this new book by journalist and science writer Surendra Verma. Why Aren’t They Here? 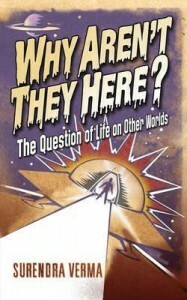 The Question of Life on Other Worlds encompasses a massive range of subjects in its 200-odd pages, including not only the obvious (and bang up-to-date) astronomy and astrobiology, but also the philosophical and cultural aspects of the search for life. Verma has a gift for humanising his subject, and the book is full of stories about the people who have contributed to the search, even if they didn’t know it at the time. He writes in an informal and non-technical style, making Why Aren’t They Here? a very accessible read. The only real criticism that could be levelled at the book is that in its breathless flight through the subject, it flits too rapidly from one area to another without doing full justice to the individual topics. Whilst this is true, several volumes would be needed to even come close to doing justice to the title, and this volume, slim as it may be, proves an enthusiastic introduction to the field.